Henry Timms is President and CEO of 92nd Street Y, the renowned cultural and community center. More than 300,000 people visit 92Y annually, and millions more participate in 92Y’s digital and online initiatives. Under Henry’s leadership, 92Y is re-imagining the role of the traditional community center, using innovative programming and new technology both locally and globally. Henry oversees the organization’s 40+ businesses, including critically-acclaimed performing and visual arts programs; a world-renowned series of talks and readings; a huge range of family and wellness programming; professional development opportunities; and more. In 2012, Henry founded #GivingTuesday, a global day of giving that was honored with a Cannes Lion at the International Festival of Creativity; the PRWeek Global Award for Nonprofit Campaign of the Year; and the inaugural UJA-Federation Riklis Prize in Agency Entrepreneurship. Henry also co-founded the annual Social Good Summit, which pioneered a new, inclusive summit model that opened up the critical discussions held during UN week to a much wider audience and led to concurrent gatherings around the world. As an extension of the Social Good Summit, Henry led the team that developed a MOOC (massive open online course) called “How to Change the World,” offered with Wesleyan University; 51,000 students participated in its first year. 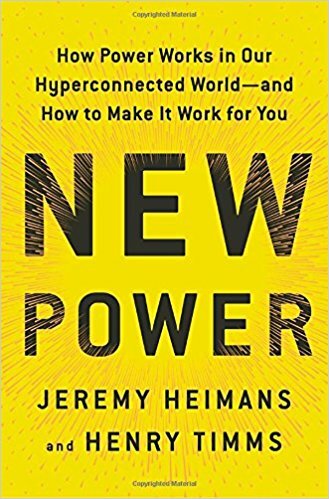 Henry’s work has been profiled in publications like the Harvard Business Review, and his most recent thinking with Jeremy Heimans on “new power” was featured as the Big Idea in the Harvard Business Review and by CNN as one of the ten top ideas to change the world in 2015. Henry is a Visiting Fellow at Stanford University’s Center on Philanthropy and Civil Society and a member of the World Economic Forum’s Network of Global Agenda Councils. In addition to being listed on The Nonprofit Times Power & Influence Top 50 for the past three years, Henry was named the NonProfit Times Influencer of the Year in 2014. Henry has been honored as one of Crain’s New York Business “40 Under 40,” City & State's 50 Most Influential People in Manhattan and the T&C Top 50: The Top Philanthropists of 2017. Sign up for Henry Timms newsletter, and more.